At a meeting at the home of Founder, Geoff Rundle in Wallaroy Road, Double Bay, members of the Woollahra Action Committee (WAC) met with other concerned residents to form Residents First Woollahra (RFW). It was not so much to dissolve WAC but to revitalise and re-energise the party with a new name, fresh faces and to develop a platform and statement of ideas to protect Woollahra’s heritage and to prevent over development in a community that was already facing the rezoning of White City and the overdevelopment of Kiaora Lands in Double Bay. RFW is an independent group of residents determined to keep major party politics from dominating Woollahra Council. Those present at this meeting were, Geoff Rundle, a WAC Councillor, WAC Committee members, Brian France, David Leach, Ian Plater and Doug Markell, residents Jim Morrow, David Chrystal, Philip Mason (President of Double Bay Residents Association), Malcolm Young, Jasmine Steel, Virginia Rundle and Bruce Bland. It was resolved to form a new party for the 2004 Local Council elections, a new and catchy name had to be found, a logo and a statement of goals developed, and candidates selected who would reflect community concerns. Several meetings later Residents First was formed, the Party was registered by the State Electoral Office and the Party Launch was held on 27 September 2003 to a large gathering at the Rundles. WAC was itself formed in the early 1960’s, motivated by the gross over development of unit blocks right across Woollahra, but most particularly in Darling Point. For many years WAC controlled Woollahra Council and re-organised very successfully the Development Control Plan (DCP) to prevent further high rise in Woollahra. During the late 1980’s WAC lost its way with its own foray into re-invigorating Double Bay with a proposed underground car park under Guilfoyle Park ending in failure, followed by the Scotts hotel and retail development collapse resulting in the loss of the Council depot and the ensuing bad press over the bankruptcy of Scotts Development. WAC lost its dominance with the decision by the Liberal Party to field candidates at the 1999 Local elections, when only two WAC Councillors were returned. The 2004 March Local Council elections saw great acceptance of Residents First Woollahra and four Councillors were elected, Cr Julian Martin, Paddington Ward, Cr Claudia Cullen, Cooper Ward, Cr Geoff Rundle, Double Bay Ward and Cr Wilhelmina Gardner, Vaucluse Ward. At the ensuing Mayoral election Cr Rundle was elected as Mayor for the following 18 months. The headlines in the Wentworth Courier read “Libs ousted as Rundle puts Residents First”, it was a great start for Residents First Woollahra which has continued to grow in popularity and membership. Prior to his retirement, Cr Rundle was re-elected Mayor again in 2007/8. Four new RFW Councillors were elected in September 2008, Cr Greg Medcraft (a former WAC Mayor), Paddington Ward, Cr Malcolm Young, Cooper Ward, Cr Ian Plater, Double Bay Ward and Cr Susan Wynne, Vaucluse Ward, who are continuing to uphold RFW principles, goals and pledges. RFW’s formidable success was reflected in the election of a RFW candidate in each ward in the September 2012 elections: Cr Elena Wise, Paddington Ward, Cr Luise Elsing, Cooper Ward, Cr Elena Kirillova, Double Bay Ward, Cr Jeffrey Zulman, Bellevue Hill Ward and Cr Susan Wynne, Vaucluse Ward. All Residents First Councillors pledged to vote against overdevelopment and to protect and nurture the feeling of our community through thoughtful developments that enhance the environment and way we live. 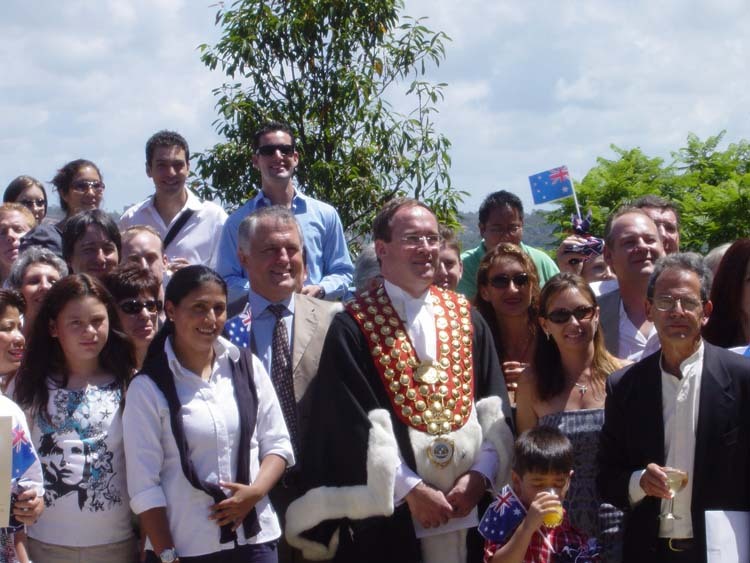 Residents First founder and former Woollahra Mayor Geoff Rundle with Malcolm Turnbull MP and New Australian Citizens, Australia Day 2005.